Terry Butcher today apologised to the Hibs support for the “unacceptable” performance against Dundee United which put another huge dent in the Easter Road outfit’s hopes of a first top-six finish in four years. Butcher was clearly deflated by the display his side had produced. They enjoyed some luck when goalkeeper Ben Williams saved Nadir Ciftci’s penalty – a highly controversial award by referee Euan Norris – but it only delayed matters as the Turkish hitman later opened the scoring. 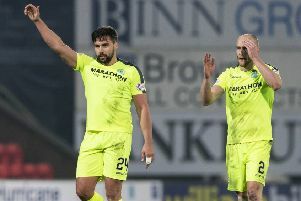 Jordon Forster threw Hibs a lifeline when he levelled on the stroke of half-time but thereafter Hibs simply fell apart, Gavin Gunning nodding United ahead, Gary Mackay-Steven then blasting a second spot-kick over before substitute Farid El Alagui added a deserved third as United clocked up a fourth successive win. Butcher said: “They thoroughly deserved their win, no doubt about it, we were beaten, well beaten by a much, much better team. When they are in that mood and when they are allowed to play as we allowed them to play they can carve you open and that’s what they did on many occasions. Butcher revealed Taiwo was adamant he’d won the ball when he picked up his first booking but admitted Hibs were perhaps lucky not to have ended the match with only nine men when Ryan McGivern, who had been booked for contesting United’s first penalty award, sent United skipper John Rankin hurtling into the touchline hoardings in the dying minutes of the game. On a day when Hibs launched their 2014/2015 season ticket campaign, the boos rang round Easter Road on the final whistle, leaving Butcher to say “sorry” for such an inept display.